Based on real events, a story of murder set in the South Pacific before the First World War. 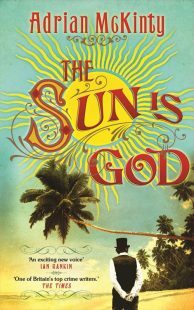 It is 1906 and Will Prior is in self-imposed exile on a remote South Pacific island, working a small, and failing, plantation. He should never have told anyone about his previous existence as a military foot policeman in the Boer War, but a man needs friends, even if they are as stuffy and, well, German, as Hauptmann Kessler, the local government representative.So it is that Kessler approaches Will one hot afternoon, with a request for his help with a problem on a neighbouring island, inhabited by a reclusive, cultish group of European’cocovores’, who believe that sun worship and eating only coconuts will bring them eternal life. Unfortunately, one of their number has died in suspicious circumstances, and Kessler has been tasked with uncovering the real reason for his demise. So along with a’lady traveller’, Bessie Pullen-Burry, who is foisted on them by the archipelago’s eccentric owner, they travel to the island of Kabakon, to find out what is really going on.